Tucked high below the main summit of Braeriach, this corrie can hold onto skiable snow well into late spring/summer, despite it's generally southerly aspect. There are 3 obvious, and relatively popular lines, but others are possible. West Gully is the steepest and widest of the 3 main gullies. East is the easiest angled, but narrowest of the main gullies. Central Buttress Gully is the most interesting. All 3 are superb in the right conditions. From the North there are a couple of obvious options. As per Garbh Choire Mor, if you are happy cycling with skis, then the Gleann Einich approach is possibly best. Alternatively, parking at the Sugar Bowl car park on the ski road, and walking through the Chalamain Gap and over Sron na Lairige would be the most popular option. Approaching from Deeside is also reasonable (with a bike and trainers! 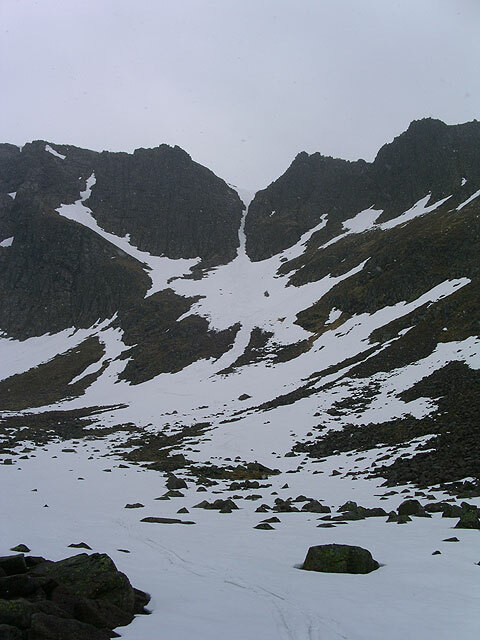 ), cutting directly up the eastern spur of the corrie rim from the Lairig Ghru (allow 3.5-4 hours). There is one relevant Scottish Avalanche Information Service forecast for Braeriach: Coire Bhrochain. On the West side of the corrie, there are a couple of options that are more amenable than the 3 main gully lines. The most obvious feature is a shallow gully line low down, below a wide easy angled bowl. From above, the entrance to the gully line may not be obvious, but it is definitely worth skiing, as it's a nice line. It's a good one to do if you wish to practice for narrower and steeper lines elsewhere. If you don't fancy this line, there's an even easier one to the skiers right, taking a slightly right trending line. Notes: Nearly grade I at the narrows. West Gully is a wide open chute that holds snow well late into the season. It is one of the steeper Grade I routes, particularly at the top, where it can be heavily corniced. The angle can often be similar to that found on banked up Grade II gullies. Skiers left can offer the easiest entry to the gully. Once beyond the cornice, the gully is wide enough to allow decent radius turns. Central Buttress Gully does not conform to the classic gully form of its neighbours either side. 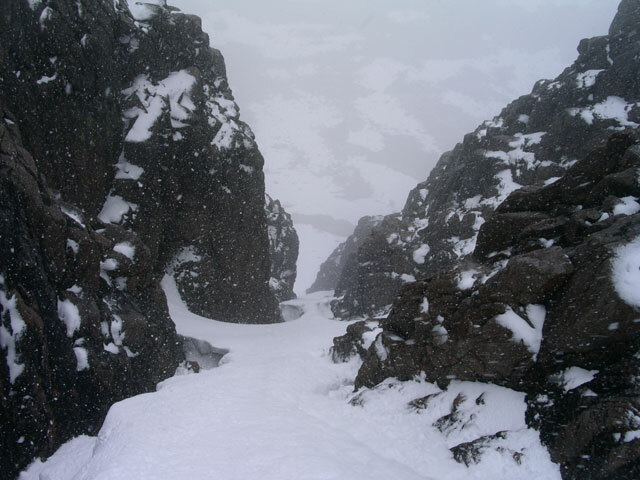 It curls around the Braeriach Pinnacle, starting as a gully, and ending as a wide diagonal terrace. Starting behind the Braeriach pinnacle, it is often possible to find a break in the cornice at the small col. The direct entry into the gully from the plateau can be very steep. The upper section of the line is a gully, with a steep left wall. As the gully bends to the left, you pass through a gap in the rock walls onto a terrace. Below this terrace is a cliff! The wide terrace off to skiers left allows you access to the corrie floor easily. Notes: Straightforward for the grade, but there is a cliff below the dogleg of the gully. The narrow funnel of East Gully is a prominent feature from the south, and can often present itself as a white hourglass shape when most of the snow is lost from surrounding hills. The wide funnel at the top narrows considerably to a fine straight gully. Leave it late in the season, and the snow may have melted back from the rock walls, leaving a boot width arete down the gully which isn't ideal! A little earlier, and it will offer a narrow, but skiable descent. Skiers right usually offers the easiest entry to the gully. This shallow South facing gully line on the East side of the corrie provides a more amenable alternative to the main gully lines. The top of the gully is not that obvious from above, but looking down, you should see a small rocky promontory which defines the left hand side of the gully line. The top of the gully may be a bit rocky, as it faces directly into the sun, but it is worth seeking out as the lower gully is a nice ski.